today's sepia saturday contribution features a photo of josef koszcelnik (later kostelnik), my mother's maternal grandfather and five other gentlemen. josef is the seated man in the middle with the pipe in his mouth, wearing a cap with his miner's lamp still attached. like most of the old photos in my box of old photos the one above lacks any accompanying information. I don't know when the photo was taken or who the other men are, a couple of them don't exactly look like miners, at least they aren't wearing clothes miners would wear. but they do seem to enjoy each others company and a nice mug of beer! the life of a miner did not appeal to josef and he soon left the mines and he and his wife went on to establish a saloon and boarding house in bethlehem, pennsylvania. like many others who immigrated from europe and settled in northeastern pennsylvania during the late 1800s and early 1900s, josef found work in the coal mines. it turns out that after getting off the boat, three of my great-grandfathers ended up working in the coal mines. both of my mother's grandfathers worked in the coal mines and also father's maternal grandfather, andrew urinchak. 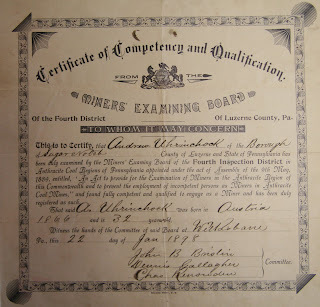 I don't have any photographs of andrew, but I do have a very old certificate, seen on right, which verifies his competency to mine anthracite coal. the certificate contains all sorts of interesting information. the document has andrew's last name as uhrinchook. I'm sure when andrew went to get his certificate, the clerk asked him what his name was and then proceeded to spell it like it sounded. it appears to me that people were fairly lax back then in terms of being precise with the spelling of last names. I have quite a few documents with all sorts of spellings of the last names of my great-grandparents and grandparents. and I remember hearing quite a few stories regarding spelling issues with all of the names on both sides of my family. well, that's all I have time to write for today - I really should do some advance planning for these sepia saturday posts, they are great fun. I only wish I knew more of the stories and the histories associated with the people in the photos. I wonder if hypnosis would help me recall all the stories I heard when I was a kid - I used to love sitting at the knee of a grandparent and listen to them wax on about their lives and the lives of their parents. by the way as soon as learned of this amazing group (it includes many of my absolute favorite musicians) I ordered one of the first of the imagined village cds - it came yesterday and includes this song. Kimy, I have you up now. Sorry, I was out all afternoon and into the evening; I just got your message now. I will come back tomorrow and give my full attention to your post. The picture is compelling. There's a tough life for you. My mother's father's family was from Reynoldsville, PA, the steel country in western part of the state. The Deer Hunter was filmed in Clairnton, which is near Reynoldsville. My grandfather called it God's country. Mmm, mug of beer looks and sounds like a wonderful idea. What a great picture. I kind of like not knowing what it's all about - so I can imagine to my heart's content! Fantastic photograph. I guess this must have been a social occasion, hence the beers. The gentleman to the right may have been the foreman? As you point out, his attire doesn't suggest that he's actually working down the mine. 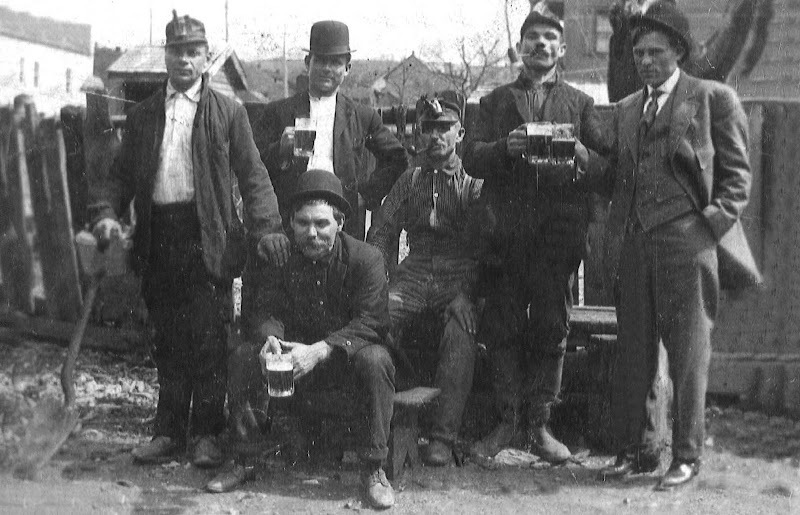 what a wonderful photo - all the hats, and the beers, great faces. Great photo. Zedo must have been quite a guy. There are miners in my family history as well, including a mine disaster in Birmingham aka Pittsburgh of the South. I too wish I could remember all the details I have heard over the years. Great job, even if you did not plan it...who would know? I didn't know your family is from that part of Pennsylvania. My grandfather is from Scranton. But we always heard that he didn't like the coal miners' kids because they used to beat him up! (His father was a teacher.) Who know, maybe he had it coming. It Was Me Indeed! They Are So Good! What A Hard Life Was\Is Mining. But They Look A Solid Group & I Bet The Beer Tasted Good! love the beer factor!!!!!! beautiful history too. Great photo, fascinating history.Tis a great CD too by the way. Lots of us have names that are wrong because our ancestors could speak English. That photo seems like something you could use for a writing group to use as inspiration for a short story. The fellow on the right looks like he could be a supervisor, but who knows. The fact that he's sharing a beer with the boys is intriguing. There is a branch of my family that spent time in Pennsylvania too, but only briefly as they were soon westward bound. Forgive me, Kimy! I completely forgot to come back and comment on this fine post and wonderful photo. How fortunate you are to have the picture. My family comes from the coal-mining industry as well. My grandfather worked as a clerk for the Dominion Coal Company in Glace Bay, Nova Scotia. My Great Aunt was the secretary at the mine and later at the museum for many years. Have you ever seen the film, "Margaret's Museum"? That's filmed at Glace Bay. Let me know if you're participating again this week, Kimy.